Registration Information for the 2019 Pink Invitational is now available. The scratch/refund deadline is Friday, November 16, 2018. ONLY same level/age group/leo size substitutions can be made until February 1, 2019, and only if space is available. No exceptions. Instructions for submitting detailed rosters, including leotard sizes, will be e-mailed to you in October. Please contact pinkinvitational@uniteforher.org with any questions or concerns. The Above & Beyond Team Challenge invites clubs attending the Pink Invitational to raise funds for Unite for HER beyond the usual entry and meet fees. Every year, participating teams do a tremendous job raising funds to support our breast cancer Wellness Programs and promoting awareness in their home communities. In 2017, most of the Pink Invitational teams accepted our challenge and together they raised over $160,000! We hope to have 100% participation in 2018 in order to beat that amount, so start early and get creative. We know you can do it! Be sure to share your Above & Beyond Challenge stories with us on social media and take advantage of our Salsa fundraising tool to help you meet your goals. We will also count sponsorships that are a direct result of your team’s participation towards your Above & Beyond fundraising total. Just be sure to let us know (i.e. family business, gym parent company, etc). This is a USAG sanctioned meet conducted in a Modified Capitol Cup format. Awards are presented at the end of each session. Participation awards will be presented to all level 3 and XCEL Bronze/Silver participants who do not receive All Around awards. Age groups follow Pennsylvania competition schedule. In an effort to save paper and help the environment, we do not provide printed score sheets for this event. All results can be found online using the links below and are updated in real time during the meet. For more information about the Pink Invitational, please contact us at pinkinvitational@uniteforher.org. AJS Pancott Gymnastics NTC began in 1997 as an expansion of Pancott Gymnastics, one of the oldest gymnastics programs in the country. It has grown to be one of the largest competitive women’s gymnastics programs in Pennsylvania, sending numerous gymnasts to Nationals and t university programs on scholarships. AJS Pancott Gymnastics offers competitive training and recreational gymnastics to hundreds of local athletes from ages 18 months to 18 years. AJS Pancott Gymnastics is owned and operated by Steve and Louise Pancott. The training center is located in West Chester, Pennsylvania. 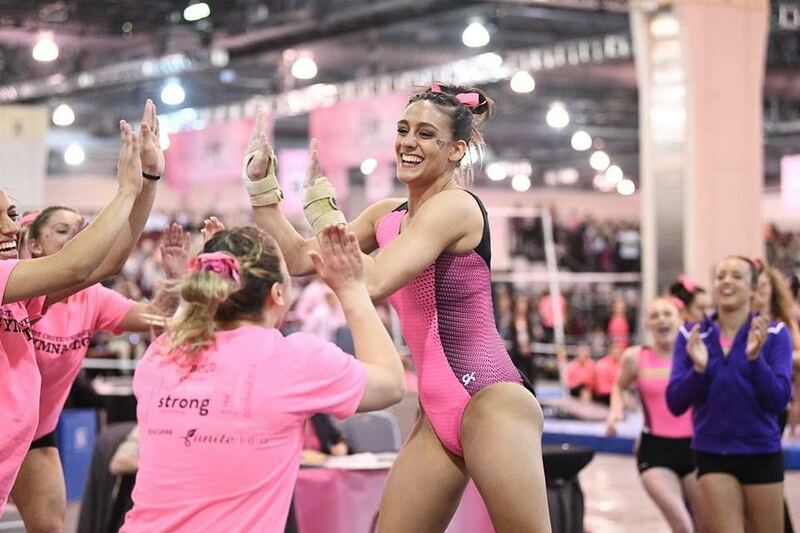 We cannot wait to welcome West Chester University Women’s Gymnastics and Southern Connecticut State University Women’s Gymnastics to the PA Convention Center on February 22, 2019.